Bicycle Day does not, as one might expect, celebrate the ubiquitous two-wheeled mode of transport, beloved of city- and country- dwellers alike the world over. Rather, it celebrates a particular historical event that involves a trip on a bicycle. On April 19, 1943, Albert Hofmann, a chemist for Sandoz, in Basel, Switzerland, has discovered LSD, where he experienced all the heavenly and hellish effects of lysergic acid diethylamide. 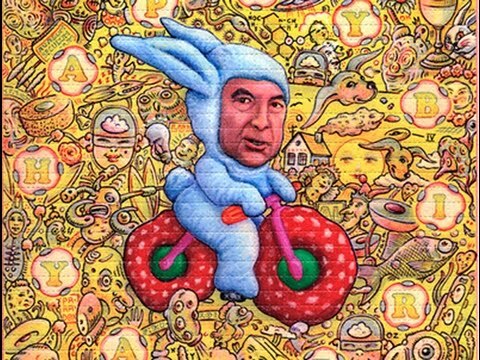 Bicycle Day celebrates Swiss scientist Albert Hofmann’s discovery of lysergic acid diethylamide or LSD in 1943, and the subsequent, and at times harrowing, ride home on his bicycle after deliberately ingesting a dose of the drug. Albert Hofmann first experienced LSD’s full effects while riding a bicycle in Basel, Switzerland, on April 19, 1943, as commemorated in this blotter-acid art. Bicycle Day is April 19, commemorating April 19, 1943, when Dr. Albert Hofmann first took LSD intentionally. Three days earlier, he had absorbed a small amount of the drug either through his fingertips or by accidentally ingesting it. On Bicycle Day, he took 250 µg of LSD intentionally and, fearing he had made himself ill, cycled home from his lab. During his bicycle ride, he experienced the effects of LSD, making this the date of the first ever acid trip. He wrote about his experiments and experience on April 22, which was later put into his book LSD: My Problem Child. This day (for LSD users) is when they celebrate the discovery and first ever use of the drug.